There are countless opportunities at SSA, but for many students, two years is often not enough time to take advantage of all of them. Angela Bailey is a n exception to this. 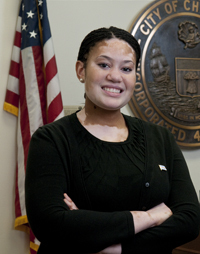 Her experience at SSA has taken Angela from law-enforcement research to a field placement at the Heartland Alliance, from researching with distinguished SSA faculty to an internship in the Chicago Mayor’s Office. Throughout her experiences, Angela has always retained and developed her underlying social work philosophy regarding the link between policy and research. In discussing her reasons for coming to SSA, Angela explained that she was attracted to the school’s history of studying poverty from the perspective of those experiencing it “I wanted to study poverty in a way that was very functional and I didn’t want to get bogged down in theory as many poverty scholars do,” Angela said. She wants to create and implement changes, and SSA was the perfect fit for this mission. Angela started at SSA immediately after her undergraduate studies at Knox College. There, she was a McNair Scholar and had done research on community and police responses to the Rodney King incident and the subsequent L.A. riots. As a former child in the foster care system, she was also very interested in poverty and how it affected communities as a whole. She would soon follow her professor and McNair mentor, Chad Broughton, now a Senior Lecturer in the Public Policy Studies Program, to Chicago as he encouraged her to apply to SSA. SSA gave her the Anita Mackey Minority Merit Scholarship and a research assistantship with Frank P. Hixon Distinguished Service Professor Charles Payne, doing research on behalf of the Woodlawn Children’s Promise Community (WCPC). Angela’s research included the examination of different management styles and best practices in classroom settings, and community-based health initiatives for the Health committee of the WCPC. She was also active on their Pre-School committee. She’s enthusiastic when talking about her favorite professor -- Charles Payne. His class, the “Social Meaning of Race,” was special for her as he provided a safe place in his classroom to freely discuss and explore issues. Originally from New York City, Angela came from an ethnically diverse environment. “I never thought about being black,” she said. That changed when she left home and came to the Midwest for her education. “Professor Payne has a way of getting people to think in ways that I never imagined that I would think about concerning issues of race and racism.” One important lesson that he taught her was to “not to give other people control over you,” when confronted with racism. From his example, Angela says that “I have learned to try to respect other peoples’ humanity, and realize that the things that they believe are based off of their experiences. People generally do mean well.” Seeing Professor Payne’s approach in leading discussions about race has helped her with her own skills in interviewing clients and in helping others to understand issues about race and identity. She completed her second-year field placement with the National Transitional Jobs Network, a project of Heartland Alliance, located within their policy and research department, where she worked as a Communications Associate. This project is the headquarters for a diverse national coalition dedicated to advancing employment opportunities for those who have difficulty entering and succeeding in the workforce. In her work at the National Transitional Jobs Network, Angela helped track legislative developments, researched Transitional Jobs initiatives, and assisted with the development of the organization’s general communications strategy. Her experiences at SSA have also been enhanced by her work in Mayor Richard M. Daley’s Office, an opportunity that she, along with fellow SSA’er Sarah Humpal AM ’10, was awarded through the prestigious City of Chicago Mayor’s Office Fellowship Program during the summer of 2009. Directed by the Assistant to the Mayor, Kate McAdams, the program annually selects high-achieving and exceptional students from across the nation to participate in a ten week long hands on experience in municipal government operations. “The program was amazing. In some ways, I did more in a summer there than I did in a year at SSA,” says Angela. Fellows did everything from write reports to visit with commissioners to attend weekly events arranged by the city so that they would become familiar with how each of the departments worked. One of her favorite events was when the Fellows met with one of the planners of Millennium Park to learn about behind the scenes day-to-day operations. On another occasion, Ron Huberman, AM (SSA) and MBA ’00, candidly spoke to the Fellows about his work with the Chicago Public Schools. Angela initially applied for the Fellowship, because through her personal and educational experiences she came to believe that “too often there is a gap between the creation of policy initiatives and ground-level experiences affected by social policy.” In her application, she wrote about how she specifically wanted to learn about how mechanisms between city departments and people living in Chicago communities work – be it police and communities, city social services and communities, or the housing department and communities. She wanted to figure out ways where these relationships could be optimized and/or improved. During her Fellowship, one of the issues she explored in her research was how high-violence communities could break the codes of silence in terms of their relations with local police. She was encouraged to do this work, in part, as there is much interest from city senior staff on this topic. At the end of the program, each Fellow created a small report for senior city officials about an idea or project, based on their research that could be implemented to improve the City. For this project, Angela chose to submit her work on improving community and police relations. All reports from Fellows were included in a yearly compendium “New Ideas for the City of Chicago,” which is reviewed by top city officials.